OK. So she really wanted him to do the raking, hoeing and other tasks that she doesn't like doing. I won't tell him, if you don't. Frankly, I was getting a bit tired of the blues too. I'm back. Interesting movie....An uncountable number of car/helicoptor crashes, about 15 minutes of dialog and not a lot of story. Still fun to watch, but come on. Hire a writer already. Not just stunt men. 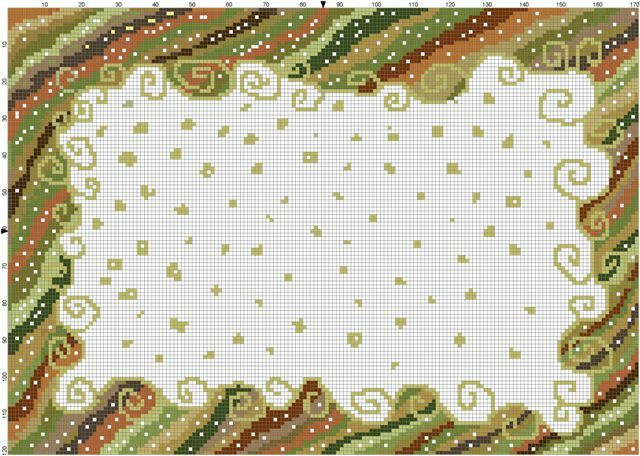 Anyway, I finished the tweaking of Zar's living room rug design. You will have to blow it up and choose colors that you prefer. This one will take you a while. As always, this is for personal use only. The pattern/rug is not for resale. I would love to see it if anybody stitches it. whatever I have.I think I may paint the design on the canvas first. Have you ever done that? I used to work for a needlepoint designer that had us paint her canvases that she sold to needlework shops. Hola. Me ha encantado el esquema de la alfombra, me lo guardo, con tu permiso, y quizá lo borde. Just popped on to ask if you forgot to put the daily reminder to vote? You and your closest competitor have been neck and neck the last couple of days. Wishing you luck. I did kind of forget to post a 'Vote for Tessie' yesterday..Oops! Not going to win that way!